China produces both Famous Teas and Country Teas. As wonderful as the Famous Teas are, there are plenty of reasons to want to drink a simple, less expensive tea that is still delicious and satisfying. So, to give these less well-known teas the credit that they are due, we are re-introducing the concept of Country Tea. Years ago we sold quite a few of these teas – they were very popular choices from the end of the Cultural Revolution until the late 1990’s. However, over the last 15 years, these teas have been overlooked due to the renaissance of interest in China’s Famous Teas and now many other seasonal, origin-specific Chinese teas. Country Teas as well as Famous Teas are from all of the classes of tea – green, yellow, white, oolong, black and Pu-erh. What is interesting about Country Teas is their delicious reliability and pure, solid flavors. While we find the Famous Teas and origin-specific teas to be fascinating (and we love being challenged by their evocative flavors) those teas are expensive and their seasonality can make them unpredictable and the crop size variable. So we believe that there are times to lay the ‘fancy’ tea aside and simply enjoy a cup of straightforward, regional tea the way that tea has been enjoyed in many country regions of China. These teas the local or regional teas that millions of east Asians drink every day. The idea of Country Tea/Famous Tea is not just a Chinese phenomenon – teas in Japan and Taiwan have similar rankings, too. In all cases, Country Teas are sold only by simple designations of origin or generic, simplified names such as: Gunpowder, Sencha, etc. Gunpowder the propellant was invented in China in the 9th century – during the late Tang dynasty (618-907 CE). The invention appears to have been made accidentally by Taoist alchemists seeking to produce the elixir of immortality. Instead, they concocted what we call ‘black powder’ today. Whether or not the early testers attained their goal of ‘immortality’ is a matter of speculation! Gunpowder tea is so named because of the logical play-on-words that exists between Gunpowder tea and gunpowder the propellant: the finished tea resembles the steel-grey/green color and pellet shape of the propellant gunpowder. Additionally, the ball-shaped finished tea pellets gently ‘pop’ open when exposed to the steeping water and, the stimulant nature of tea could be construed as a pun on the term propellant. Both being of Chinese invention, it was most likely either an observant foreigner who first coined the term for use describing the tea or perhaps there was once a very improperly-labeled container that must have been a disappointment for the recipient who expected propellant and received tea by mistake! Picture an English ship’s captain plying the waters of the South Pacific in the 1800’s. Imagine his disdain trying to fire his cannons at marauding pirates with only Gunpowder tea as a propellant! Cup of tea, Mate-y? 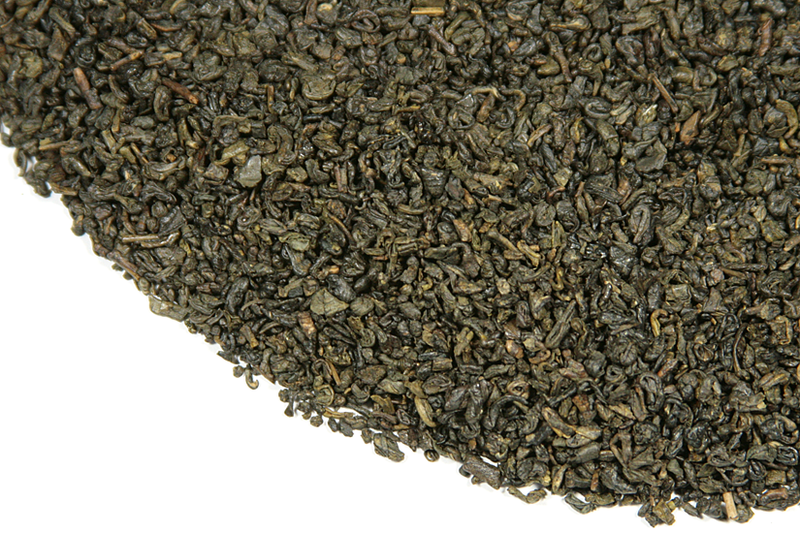 Gunpowder tea is one of the best-known and most liked of all the standard, country green teas. 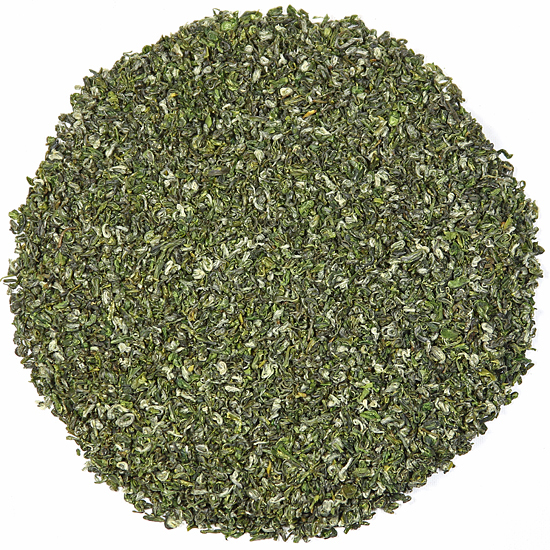 Its popularity is perhaps due to how easy and forgiving this green tea is to steep. It is simple to measure, will tolerate a range of water temperatures, and is interesting to watch steep. Gunpowder tea can usually be steeped a second time, depending on the duration of the initial infusion. 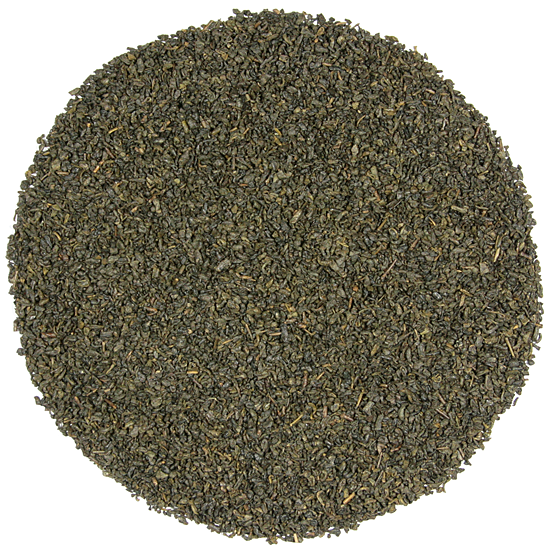 Gunpowder tea is also the base tea used for Morocco’s famous Moroccan Mint tea. Formerly rolled by hand, Gunpowder tea is now manufactured primarily by machinery (rollers and tumblers) that roll and shape the leaf tea into the familiar looking little pellets. Gunpowder tea was shaped into its pellet form originally for quality and keeping purposes, as it shipped more compactly and retained its fresh flavor better with so little surface area exposed. Gunpowder tea was among the first whole-leaf forms of tea, a logical progression from the compressed tea manufactures that preceded it. Gunpowder tea is generally manufactured using more mature tasting and larger-sized tea leaf during summer and fall harvest periods. Larger leaves are traditionally used for rolling the leaf tea into pellets as they are more pliable than spring leaf – which is important for properly shaping the tea pellets. 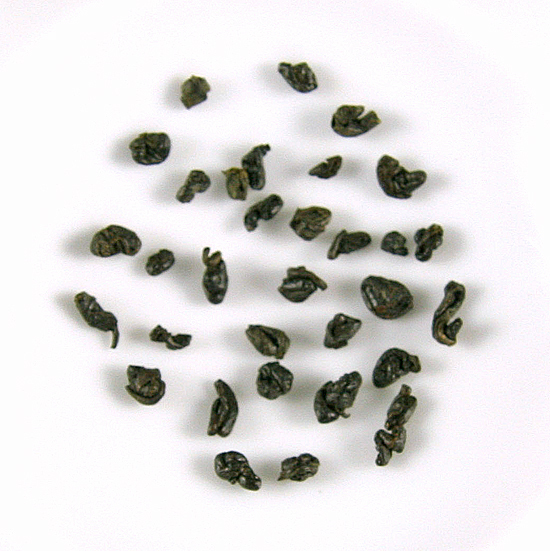 There are many grades (sizes) of Gunpowder tea, the finest being the smallest (as it is with most tea). The smallest size and highest grades are marketed as Imperial Pinhead or Superfine Pinhead (this latter being a reasonably modern sub-term). This year for the first time we have been able to source an organic Gunpowder Tea that is both organic and tastes good! We have likely tasted more Gunpowder Tea than any other type of green tea while searching for a high quality organic version. Because the price for Gunpowder tends to be very low, not too many organic growers have been willing to manufacture an organic version, given the high labor costs to pelletize the leaf. But now, finally, for 2018, we have found this organic Superfine Pinhead Gunpowder Tea (that meets the EU Standard) that is virtually indistinguishable from the Imperial Pinhead Gunpowder Tea that we have sourced for many, many years. We think that both our regular country green tea drinkers and many new enthusiasts will be pleased with this delicious tea. We are keeping the price very close to what we have been charging for years, so that everyone can enjoy this wonderfully rich and full-flavored ‘country green’ tea. This is because a small amount of our Superfine Pinhead Gunpowder tea is manufactured using early-season leaf a few weeks before the larger-leaf ‘regular’ Gunpowder teas are made. 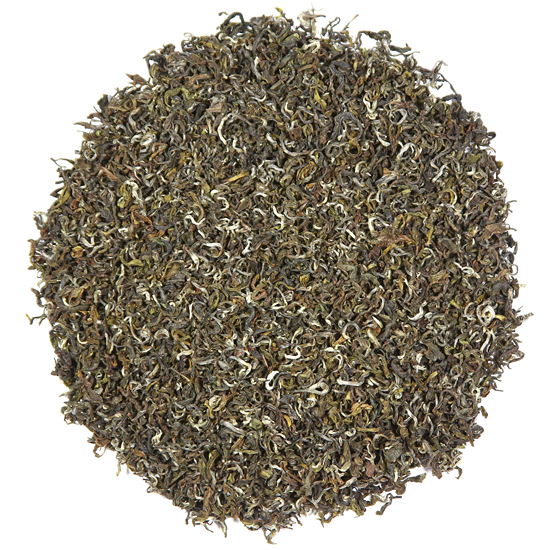 This short -production seasonal tea has a clean, satisfying flavor and consists of very tiny pellets. This is the same season during which our Imperial Pinhead Gunpowder was manufactured, and so the size, shape, color, and overall appearance is quite similar, as well as the flavor. When plucking the leaf for Gunpowder tea, it is critical that the pickers be accomplished, as torn leaf will create problems during the rolling phase, and irregularly-sized leaf will need to be sorted out, as it is extremely difficult to roll uniform pellets from diverse leaf.